Laying the groundwork for a presidential visit later this year, John Kerry met with senior Laotian officials. 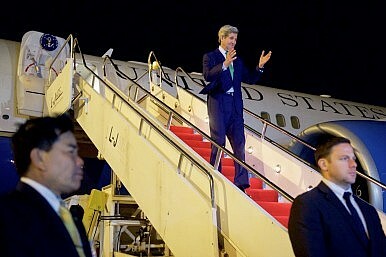 U.S. Secretary of State John Kerry arrived in Laos for a rare visit just days after the country’s Communist Party selected a new leader. Kerry’s visit to Laos launches a broader Asia-wide diplomatic tour, which will also include stops in neighboring Cambodia and China. According to the Washington Post, Kerry is the third secretary of state to visit Laos in six decades–past high-level U.S. visits included Hillary Clinton in 2012 and John Foster Dulles in 1955. In part due to the legacy of the Vietnam War and a U.S. bombing campaign in Laos in the late-1960s and early-1970s, ties between the two countries have been cool, though gradually improving. In Laos, Kerry met with Thongsing Thammavong, the country’s prime minister and a member of the Communist Party’s Politburo. Kerry also met with Thongloun Sisoulith, the country’s deputy prime minister and foreign minister. Kerry will not meet Bounnhang Vorachit, the country’s erstwhile vice president, who was elected to the position of secretary-general of the Central Committee of of Lao People’s Revolutionary Party (LPRP) on Friday. Laos will be particularly significant for U.S. diplomatic outreach to Southeast Asia this year as it takes on the chairmanship of the ten-member Associated of Southeast Asian Nations (ASEAN). The United States has sought to advance its interests in the region and counteract Chinese influence through ASEAN. Now, the Lao, I think, are off to a very good start. They have overseen some joint statements by ASEAN foreign ministers in response to world events. I and my colleagues have held consultations with the Lao – preparation for the agenda this year – at the summit this fall. I think that the resolve that was shown by the ASEAN leaders in 2015 on the South China Sea, which is reflected in the foreign minister and the leaders’ statement that were issued with Lao support in the course of the year, are an indicator that, number one, the level of concern about the tensions in the South China Sea is very high among ASEAN; but number two, that all 10 of the members place a premium on the unity and the coherence of ASEAN. And I think it is going to be very difficult for an external power to manipulate individual members in a way that paralyzes the group as a whole. The U.S.-Laos bilateral relationship remains fixated on the issue of unexploded wartime ordnance. Due to the U.S. bombing campaign in Laos during the Vietnam War, unexploded bombs litter Laotian territory. The United States has long been assisting Laos clear these unexploded bombs and building bilateral goodwill in the process. According to AFP, the united States “dropped more than two million tons of ordnance on Laos from 1964 to 1973 in some 580,000 bombing missions aimed at cutting North Vietnam supply lines through the neighboring country.” Kerry himself is a veteran of the Vietnam War, but did not spend any time in Laos during the war. For now, any major bilateral announcements between the United States and Laos will likely come when U.S. President Barack Obama visits Vientiane later this year. With his anticipated trip to Laos for the annual ASEAN summit, Obama will become the first U.S. president to visit the country. In a press briefing ahead of Kerry’s trip, a senior U.S. State Dpartment official noted that most major announcements will come during Obama’s visit. More so than any year since the end of the Vietnam War, 2016 could help elevate Laos’ visibility on the United States’ foreign policy radar for Asia. Laotian chairmanship of ASEAN has given the country immediate relevance, but it appears that Washington is poised to make the most of this opportunity to advance the bilateral relationship as well. With a place on the presidential travel calendar this year, U.S. outreach to Laos will be worth watching in 2016.